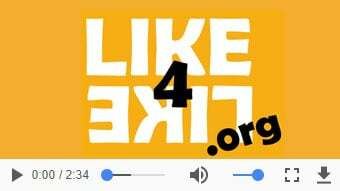 Like4Like.org - Get 100% FREE Facebook Likes Right Now! Get Free Facebook Likes, Followers, Shares, And Comments! Get "Free Facebook Likes" on the fast, simple and safe way now. Gather real "Facebook Likes", and users without bots, will push you into the social spotlight and raise your brand recognition. Get Free Twitter Followers, Retweets, And Likes (Favorites)! To get the most out of your Twitter, you want to gain free followers on your Twitter. The more people that are following you there, the more likely it is that they will see what you're doing. We can help you grow your Twitter following safely and responsibly. Get Free YouTube Subscribers, Views, Likes & Comments! YouTube View exchange, like all features, works on a "More Active - First Served" basis! The users who are more active, get their pages displayed first. The more videos you watch, the more users will watch your videos back! "I watch your YouTube Video - you watch mine". Get Free Google Plus & Circles! StumbleUpon is a social website where people share their favorite websites with other members. It is a good idea to submit your niche stores to StumbleUpon for free backlinks and site promotion. The concept seems easy. Provide engaging images of your product or service on your website, pin them to Pinterest, and allow the image to attract your customers to your site. Not only does this link forward people directly to your site, but will also boost your Search Engine Rankings. Instagram pictures provide a great collage and give your audience a better insight into your company. You can promote anything your company may be doing and is absolutely free. From products and services - to employees - to customers - to conferences. Vimeo refers to a video sharing platform that allows users to upload their videos, share videos and also watch videos uploaded by other users. Vimeo is a popular social networking platform lately. This popularity is utilized by well-known brands to promote their products and services globally. Vine is an application website owned by Twitter. It offers it's users the possibility to create short video clips to a length of six seconds as a maximum. Having a Vine account is a useful tool for a budding film enthusiast or even a small business owner. These are proven marketing techniques that help kickstart with safe free fine followers and quality free vine likes. Here is so much value exchange connected with social networking, hence our focus on the social links you can add to your profile - why not pad out your SoundCloud profile with links to your website, Facebook, Twitter, Tumblr and more. Myspace is all-new, and it's all about making music social. The new site is backed by Justin Timberlake and incorporates many elements of modern web design, particularly an emphasis on visual media. The new Myspace is pretty. It incorporates many of the trends in modern web design and social media — big visuals, responsive design, easy discovery — and gives them a clear focus: connecting through music. And it really works. Reverbnation is an online distribution and networking site for musicians who do not have a publishing or label to release their music. Reverbnation has tools and they can be used to upload songs. It can also be used to create a widget that is flash based to embed on your site. People can listen to your music and show up on your website or even join your mailing list or share your music. Ask.fm is a website for social networking that allows users to ask questions from different parts of the world, with the anonymity option. On this website, Ask.fm, the answers are rated by the if they like them. You can get absolutely free Ask.fm likes and grow the rating of your answer. Get Free Flickr Faves Exchange! Flickr is the best sharing and online photo management application in the world. It allows showing off your preferred videos and photos to the world. FlickrFaves refers to the small utility that allows downloading versions of the high resolution of your Flickr faves (favorites) to your hard drive. Flickr faves are written in Java and is a cross-platform utility. Get Free Twitch Followers Exchange! Twitch starter is the name of the online community that assists you in getting extra followers and viewers. Professional to new gamers of all ages use Twitch as it makes streaming better. There are cool tools, blogs, forums and websites that Twitch gamers and streamers can get going. OK.ru is the Odnoklassniki social network official app. This is a Russian social network identical to Facebook, mainly used in the ex-soviet republics such as Moldavia, Armenia, and Georgia. OK.ru allows free OK.ru joins and you can enjoy uploading pictures and videos, publish on others walls, chat with other users, in fact, enjoy sake Facebook experience. VKontakte (Internationally branded as simply ‘VK’) is the most popular and free social network service in Russia, Ukraine, Belarus, and Kazakhstan. VK not only support an interface highly reminiscent of Facebook but incorporates media features that make it more like YouTube, Pandora, and MySpace rolled into one. Great for businesses, musicians, webmasters, retailers, acts, personalities, video tutorials, bloggers, models, actors, athletes and more! Earn bonuses by referring others!!! By liking other peoples fan pages, sites, photos, video and much more, you have been given a chance to raise up your pages, all across the Internet! Earn free credits by liking and they will like back! is a network that will help you grow your social presence for FREE. - We allow you to look and choose who you want to like, subscribe, follow, view, circle, hit, share and skip those who you are not interested in. - We do not sell likes, subscribes, friends, followers, views, hits, circles and shares. - We will never request for usernames or passwords of your social network accounts and will never post, tweet or update status from your accounts. - We have a strict NO Bot, NO Macro, and NO Automation policy.